"If I am right, the rents will slide, or at least drift lower..."
₱ 28,000 /Month / 27 sqm. Should I Buy Investment Condo Makati Manila Philippines? The owner of this flat in Gramercy might be better off finding a manager living closer to the actual flat. The would-be-manager was not so keen to take this on, and it took him almost a month to visit the property, because of "the heavy traffic" going into Manila. 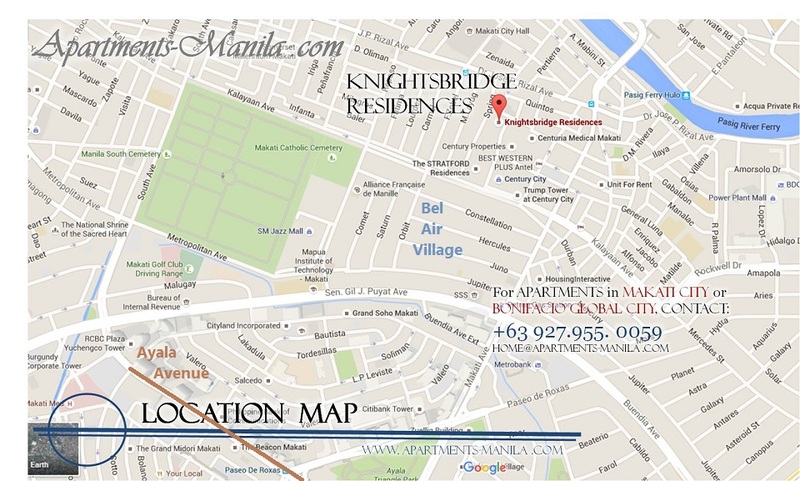 "Invest within easy walking distance to Greenbelt or Rockwell. Also look look to be close to offices were higher paid executives might work. You want to be close to: Work, Schools, Shopping, and Entertainment. " The Vlogger was impressed by the amenities, as was I. My biggest concern with the place is the location. 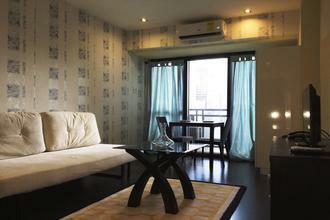 The high-paying jobs, providing sufficient income to pay a reasonable rent are in Makati's main CBD. In the rain, it may be hard to get a cab, and there would be an uncomfortable walking distance in the rain, holding an umbrella, to get to Ayala Avenue - if a tenant worked there. But the view from the amenities floor, with 24/7 service is superb. I also liked the coffee shop on the amenities floor. Our changing Manila: Trumped before we know it? If all goes on schedule, Trump Tower at Century City will become the ... is the Philippine Bank of Communications on Ayala Avenue in Makati. The Forbes Media Tower project will be undertaken by Century City ... developments in recent years with the introduction of Century City Mall, the ... Centuria Medical Makati, the Philippines' largest outpatient medical facility. CCDCII shall finance the projected Php4.5 billion total project cost through Php 2.3 billion of equity from CCDC and Mitsubishi, and a ten year Php2.2 billion senior loan granted by the Bank of Philippine Islands. BPI has approved the loan on the basis of the project’s strong financial viability amidst the rapidly growing office space sector and its confidence in the combined strength and experience of Century and Mitsubishi. Do you think such a building can be finished in one year and half?? It is still promised for 2018. I was wondering for a while if the reason behind the delay was because it formed a single contiguous L-shaped excavation with Forbes Media Tower around a corner of Centuria Medical, and that if it was dangerous to proceed with the construction on the corner end until FMT's basement levels have been filled out. By that time it would've added adequate support for Centuria and they could then safely proceed with the more extensive underground levels of the Spire. I dunno, Centuria looks to me to be sitting on a precarious spot with those buildings too close in proximity so that it's literally standing on the edge of that hole. I mean look at that corner of Centuria from this angle from above. This shot was taken early in FMT's excavation. Remember a part of Grand Hyatt's excavation collapsing at one point? MAYBE it's that kind of accident they were trying to avoid? Rising at 250 meters above ground, the 56-story building is designed by award-winning international architectural firm Broadway Malyan. Enclosed in glass and steel, the tower will feature a “peeled façade” design and spire with the top and bottom corners that appear to be peeling off the structure. It’s a dramatic architectural marvel of steel and glass. Its curtain wall façade maximizes spectacular panoramic views of the city. The façade’s function is environmentally responsive to light shelves and shading systems designed to react to the building’s orientation in relation to the sun’s path. “It’s really just an iconic, modern building, very tall, very chic, something that really symbolizes everything that a Trump project means,” said Eric. The Gramercy Residences is the Philippines' first fully-furnished, fully-serviced, hyper-amenitized and fully-technologized condominium - a New York-inspired luxury tower of unmatched grace and elegance. It rises a magnificent 71 stories into the sky. + "It began streamlining its business and laying foundations for allied business segments as early as 2014"
+ "In 2016, the firm turned cash flow positive for the first time since its initial public offering"
The report makes it sound like real improvements are being made to get past negative cash flow issues that have plagued the company for years. I would like to study the financials when they are available. Like most property developers, CPG recognizes, its Sales and its Income when it inks a sales contract. It then needs to collect the installment payments that are called for in the contracts. During the collection phase, profits drop, because they were reported upfront. With this process in mind, I would expect profits to continue to slide, until they can grow their other, non-high-rise line(s) of business. An careful examination of the financials when they are available, may reveal whether or not they are having some collection problems. "For 2017, we plan to spend P 5 billion in our condominium projects and an additional P 1billon in lasing assets,"
Last April 1, the company unveiled their first affordable housing project, PHirst Park Homes project, catering to first time buyers. Within this year, it wlll launch its first major leisure and tourism project. LISTED real-estate developer Century Properties Group (CPG) Inc. recently entered the affordable-housing category with the introduction of its PHirst Park Homes. “It is a premium brand within the affordable-housing category that celebrates the very important milestone of first-time home ownership. More important, it espouses pride of ownership,” Marco R. Antonio, CPG chief operating officer and managing director of PHirst Park Homes, said in a press statement. “PHirst Park Homes raises the bar of what affordable housing is and should be in the Philippines. We are pushing the envelope to make beautiful, well-designed homes attainable to a wider market—legacy homes that the next generation will enjoy,” Antonio said. CPG has formed a partnership with Japanese conglomerate Mitsubishi Corp. for the project. It is slated to launch a series of housing communities, starting off in the second quarter of 2017 with a 26-hectare community in Tanza, Cavite. Century is said to be offering it for sale, at some billions of Pesos. Are there issues with buyers? With lenders? Does anyone have any facts to offer? Licensing deal on a luxury residential tower under development with Century Properties Group, whose shares surged 20 percent the day after Trump was elected. The country’s new special envoy to the U.S., Jose E.B. Antonio, is the CEO of Century Properties. President Rodrigo Duterte has repeatedly threatened to distance himself from U.S. policy in favor of stronger ties with Russia and China. Although he’s signaled a willingness to work more closely with Trump, many of Trump’s immigration and trade policies could hurt the country’s exports and remittances.